gimp-2.10.6-setup.exe fails on Windows 7 (64bit). However, I can find NO way to select another drive, which creates the proverbial deadly embrace. I normally install GIMP to removable drives which allows me to run it in portable fashion where I continue to have older versions available for fallback purposes. What's going on here? Very strange! I know from other posts you are keen on making a portable version. Quote: ...when I try to run the installer it offers NO opportunity to select an installation drive..
That happens when the Gimp installer finds an already installed version of Gimp. It installs straight to the same location. No use just deleting the existing Gimp, the installer looks at the registry and assumes it is there. Then it tries to run the Windows uninstaller, which fails because the existing Gimp has gone. Try running through the registry and deleting anything about Gimp. That should get the 'customise' option back on the installer. Did a little experiment earlier and I do not think Gimp 2.10 is as portable as Gimp 2.8 - but try and see. Sorry, can not help with your inaccessible drive, I think that will be a Windows issue. I pretty much figured that what you describe is what was happening. It still seems like the installer ought to allow for choosing the target, especially when it gives an error saying to do that. I did search the registry trying to "Find" a "GIMP" key but there are none. Do you have any idea what registry key/s are involved? I suppose I can mount my drive where it seems to want it and then do some directory renaming to get it placed where I want it. Another idea is to try installing from a different system. I do have multi-bootable instances of Windows installed on my computers and this kind of thing is one of the reasons for doing that. Oh, I now see that the "Control Panel>Programs and Features" selection shows GIMP to be installed. 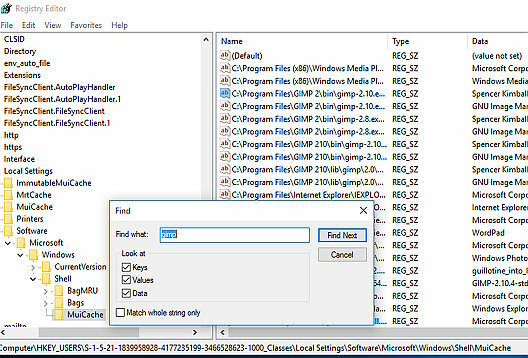 By choosing to uninstall it an error is produced saying it cannot find it but does offer to remove the record from "Programs and Features". After doing this the installer asks where to put it. Looks like this might be a clue for identifying what registry keys are involved but the installer is now running and putting it where I want it. Quote: ...Do you have any idea what registry key/s are involved? It is in the thread / video referenced. Plenty of Gimp entries and not a bad idea to run through and remove them. Thanks! Not sure what I did wrong but now I see lots of them. This doesn't overwhelm me with confidence when it comes to my desire to run multiple versions of GIMP interchangeably. Installed on my win 7 pro no prob but wouldn't run when opened. Message was "cannot find entry point." Deleted 8 1st before download. Mistake? 32 bit btw. It is worth trying the previous version Gimp 2.10.6 (revision 1) which is not affected. If C:\Program Files\GIMP 2 remains delete it. If a new Gimp 2.10 user profile was made C:\Users\"yourname"\AppData\Roaming\GIMP\2.10 delete it. Install Gimp 2.10.6 see if it works.